At the end of June, Greece was hurtling toward implosion and the European Union was consumed by an increasingly vicious internal debate over migration. That might not sound like the most auspicious time for the European Council to give final approval for the preparation of a long-awaited new “global foreign and security strategy” for the EU. But that is what happened, with the endorsement – complete with deliver-by date – buried in the conclusions of the Council’s June 25-26 meeting. The initiative has the potential to revolutionize how Europe addresses the many challenges it now faces and, perhaps more important, to give the EU the sense of purpose that it so badly needs. These menaces exacerbate and intensify one another. The activities of terrorist groups contribute to violence and instability in neighboring regions, driving an increasing number of migrants to the EU. The difficulty of integrating immigrant communities into European societies has sometimes led to radicalization, providing ammunition to nationalist politicians and further fracturing Europe. Russia’s leaders, too, have worked insidiously to break down solidarity, without which the EU is powerless to respond to the threats it faces. All of this raises serious questions about the EU’s global role, while diminishing the viability of the European project itself. Given this interconnectedness, it is unsurprising that the EU’s compartmentalized responses – such as the European Agenda on Migration, the Eastern Partnership, and the Energy Security Strategy – while important, have proved inadequate. What is needed is an overarching framework that not only underpins a self-reinforcing and coordinated response to core security threats, but also takes advantage of linkages and opportunities to buttress Europe’s capacity to act. Such a reconceptualization – not just revision – of Europe’s security strategy must account for the fact that the internal and external are becoming increasingly difficult to separate. Indeed, internally focused initiatives– the digital single market is one clear example – have significant international impacts, while external events shape life in the EU. Given this, the new security strategy should account for the wider implications of domestic policies, leveraging the full array of tools that Europe has at its disposal. Of course, lofty rhetoric and ambitious intentions will mean little unless Europe’s leaders commit to the sustained implementation of concrete initiatives. This is why the drafting process itself is so important; it presents an opportunity for a serious discussion involving EU institutions and the wider European policy community, which has already spent considerable time reflecting on these issues. 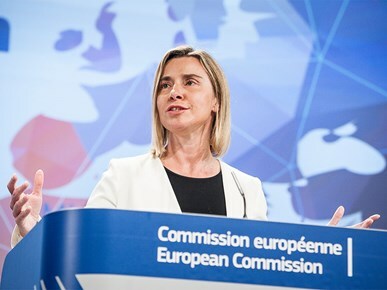 Federica Mogherini, the EU’s High Representative for Foreign Affairs and Security Policy and Vice-President of the European Commission, is correct when she urges the close involvement of member states in the discussions, in order to give them a sense of ownership over whatever strategy emerges. The aim should be to produce viable ideas, build consensus, and find linkages – first and foremost within the EU, but without forgetting allies and partners. In fact, that external dimension is essential. The ongoing euro crisis has stripped away the rationale that undergirded the integration process for decades. No longer able to point toward shared prosperity as its raison d’être, the EU is floundering in its search for a new narrative – one that convinces citizens and member states that European integration still has real value. A strategy that focuses not only on how the world impacts the EU, but also on how European values and interests can and should be projected abroad would provide a rallying cry, a broader mission, and a clear purpose. The European integration process has, at its core, always been values-driven and rules-based – two qualities that are on retreat in today’s world. By carrying the banner of liberalism, good governance, and the rule of law internationally, the EU can reverse the centrifugal forces at home that have intensified during the crisis, thereby strengthening its capacity to respond to today’s challenges and securing its position in tomorrow’s world. This is an opportunity that we cannot afford to miss.